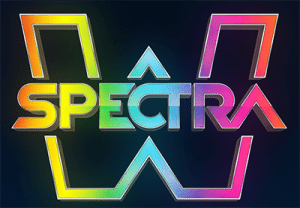 Spectra is Thunderkick’s take on the classic pokies format, taking inspiration from the traditional liberty bell machine and giving it a modern transformation. Symbols have been transformed into neon shapes set against a smooth, futuristic backdrop, where the reels come to life with flashes of light which is partly futuristic, partly disco. 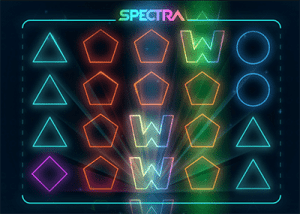 Find out how and where to play Spectra online using real money. 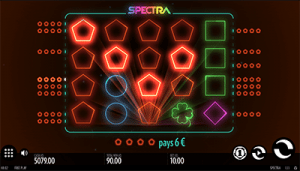 Spectra is a five-reel game with 30 fixed paylines. It comes with a theoretical return to player (RTP) of 96.4% and a potential jackpot of up to $240,000. To play, register for an account with one of our recommended casinos and fund your accountusing a trusted deposit option like Visa, MasterCard, Neteller, Skrill, Paysafecard or Flexepin. You can also opt to play for free in practice mode so you can familiarise yourself with Spectra before committing to a real cash wager. Once you’ve funded your account, all you need to do is select the amount of your wager. As paylines are fixed, you only need to select your desire coin size, which you can do by clicking the betting chip at the bottom right hand side of the reels and selecting the size your bet. Minimum bets start at $0.10, with maximums set at $100.00 per spin, making Spectra suitable to casual punters as well as high rollers. The auto-play feature also allows you to play up anywhere from five to 5000 spins with the click of a button. Wild symbol – The wild symbol is the rainbow coloured ‘W’ which substitutes all other symbols to form a winning combination. Wild symbols in Spectra always appear in stacks of four. Wild re-spins – If you land a new stack of wilds, you’ll automatically trigger a free re-spin, with wild symbols held in place. Wild nudge – During each re-spin bonus, the stacked wild symbols will nudge one position vertically towards the centre of the reels. Thunderkick is a smaller, more boutique gaming studio that’s only recently started to gain attention in the online casino world. Already Thunderkick pokies have become hugely popular with Aussie players, and you’ll now find Spectra along with other Thunderkick titles available for instant-play with no downloads required at the leading casinos recommended in our casino table above. Along with offering a safe, trustworthy place to play the pokies for real money, each of these casinos offers some huge welcome bonuses for new players. Sign up using the links above to get access to matched deposits and free spins, allowing you to play Spectra for real money with less impact on your own pockets. Many software developers have tried their hand at revamping the classic pokies format, and it’s safe to say Thunderkick’s attempt is one of the more successful ones. Expanding the classic three-reel format into a five-reel game adds a lot of appeal, and the simple sophistication of the neon symbols and lights is a really nice touch. Likewise, the collection of wild bonuses adds to the appeal of the game, but the lack of bonus rounds may leave some players wanting more. If you’re looking for something with a little more pizazz, give Thunderkick’s other recent release Babushkas a go, which can also be found at the recommended casinos above.